A multidisciplinary research team at Aarhus University has provided fundamental new insight into the mechanism of the medical drug dimethyl fumarate, which is the active component of important treatments for multiple sclerosis and psoriasis. The results contribute to the development of new strategies for drug discovery. The medical drug dimethyl fumarate (DMF) has been applied for decades in the treatment of psoriasis and now also multiple sclerosis. However, the mechanism of action has remained obscure and involves high dose over long time of this small, reactive compound implicating many potential targets. Based on a 1.9 Å resolution crystal structure of the C-terminal kinase domain of the mouse p90 Ribosomal S6 Kinase 2 (RSK2) inhibited by DMF, a Danish research team describe a central binding site in RSKs and the closely related Mitogen and Stress-activated Kinases (MSKs). DMFreacts covalently as a Michael acceptor to a conserved cysteine residue in the αF-helix of RSK/MSKs. Binding of DMF prevents the activation loop of the kinase from engaging substrate, and stabilizes an auto-inhibitory αL-helix, thus pointing to an effective, allosteric mechanism of kinase inhibition. Based on earlier findings of the Iversen group, the research team investigated the effect of dimethyl fumarate on a very important class of proteins called protein kinases, and specifically the socalled RSK and MSK protein kinases. These are known for being activated in the disease mechanisms underlying psoriasis and multiple sclerosis, and it was earlier shown that their activity is diminished by dimethyl fumarate. In the new study, the research team primarily focused on determining a crystal structure of the RSK2 protein in the presence of dimethyl fumarate to find out what the underlying mechanism of action of dimethyl fumarate might be. Very importantly, the team found that dimethyl fumarate reacts covalently with at a specific site of the RSK2 protein, which is found in all the RSK and MSK protein kinases, and that this reaction prevents these protein kinases from becoming activated. This is specifically called an allosteric mechanism of inhibition. This is very important knowledge in further drug discovery and development that may build on these findings. 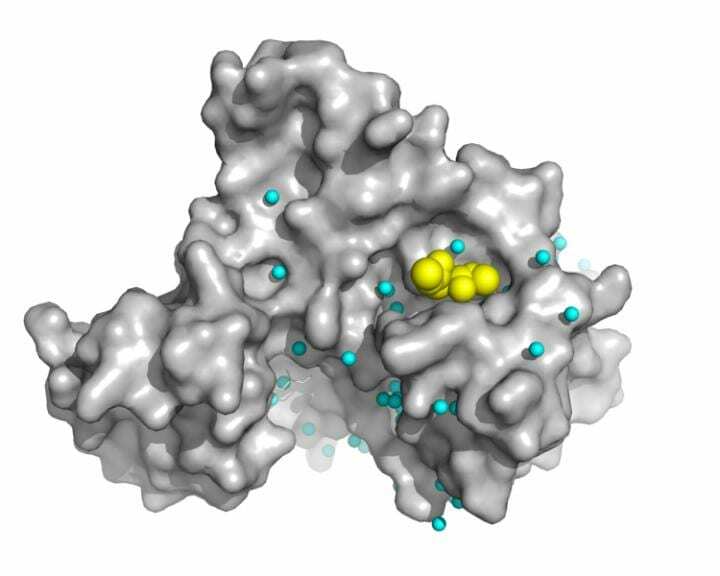 Also of importance, the binding site and mechanism for dimethyl fumarate protein kinase inhibition is unlike other known drugs that inhibit protein kinases, which include for example also many cancer drugs, so the team hopes to pursue and develop new strategies of drug discovery. The study was coordinated through a longstanding collaboration between the Aarhus University laboratories of Professor Poul Nissen at the DANDRITE center of the Nordic EMBL Partnership for Molecular Medicine, Dept. Molecular Biology and Genetics, and Professor Lars Iversen at the Department of Clinical Medicine, and the Department for Dermatology at Aarhus University Hospital. The study also included the laboratories of Professor Kurt Gothelf from the Dept. Chemistry and iNANO at Aarhus University, and Professor Simon Arthur from the University of Dundee. Most of the experimental work was performed by Postdoc Jacob Lauwring Andersen from the Nissen group, and Research Scientist Borbala Gesser from the Iversen group. "Dimethyl fumarate is an allosteric covalent inhibitor of the p90 ribosomal S6 kinases". Are substance mixtures in foods more dangerous than individual substances?